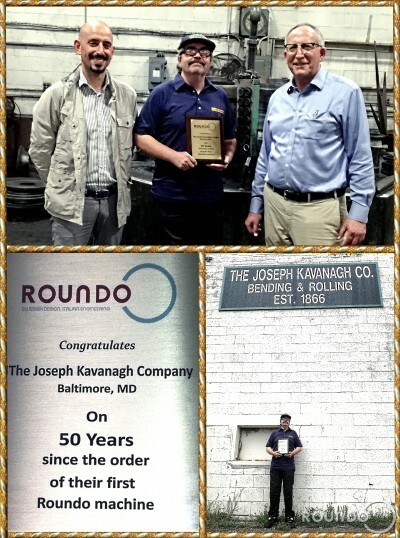 50 years ago the first Roundo machine in the United States was sold to The Joseph Kavanagh Co., Baltimore , Maryland. Current management is led by Mr. Joseph M. Kavanagh, Sr., 5th generation in his company, he said he would never part with this machine, still present in his workshop. ”This machine, and all the other Roundo I have, are workhorses, they paid for themselves several times, and they made me a lot of money through the years” he said as he was looking at the machine. Marco Massensini, sales manager of Roundo, and Steve Lazinsky, president of Comeq Inc, congratulate him on this amazing anniversary, presenting him with a plaque commemorating this occasion.